Be careful with this cow. "When I see a sacred cow, I get really hungry for a burger!" There is True Art, there is Fandom Heresy, there's even Complaining about People Not Liking the Show, and then there is this trope. A form of Unacceptable Targets, a Sacred Cow is something that is met with near-universal approval and is considered to be outside the bounds of criticism even if flaws are present. 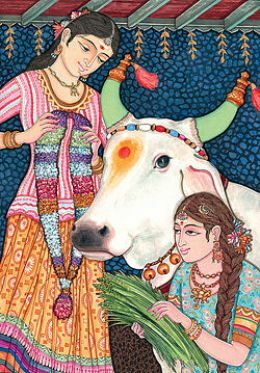 The Trope Namer is based on the popular understanding of the elevated place of cows in Hinduism, being a symbol of wealth, strength, abundance, selfless giving, and life; and no harm should come to them. In some cultures, especially in India, the slaughter of cattle may be prohibited and their meat may be taboo to consume. A Sacred Cow at the most basic level is a work or something within a work that everyone, including you, is supposed to like and is granted immunity to any form of criticism in any way, so to speak. Covering anything from a whole series or fictional race right down to props used by said fictional race within that series' universe, the Sacred Cow is considered so either out of respect, nostalgia, or plain rabid fan-love. This is usually the preserve of a rampaging fanbase, but this goes beyond the fandom and applies to almost everyone, including casual fans — right down to non-fans with passing knowledge of the work. Unfortunately, this also means a fair critique cannot be made against it at any point in time, as it'll be met with the same revulsion as Squick-inducing shipping or trolling. Being deemed as high octane Flame Bait and causing an extreme form of Internet Backdraft almost anywhere; if one is shown in a bad light, no matter how fair, expect retribution from anyone nearby to be overly harsh. Of course, this can overlap greatly with your average internet troll, so sometimes the accuser is painted as such and dealt with accordingly. An unfortunate amount of Fandom Heresy, Hypocritical Fandom, Nostalgia Filter, and The Law of Fan Jackassery tends to come from this. Often, the extreme portion of the fandom for a Sacred Cow is given a free pass, getting away with things that other fandoms would not tolerate and quickly chase out of the community. A Sub-Trope of Unacceptable Targets. Compare with True Art, where most of this arguably comes from, and Complaining about People Not Liking the Show, which everyone (or at least a good amount of people) will be doing if any cows get slain. Similar to Fandom Heresy but extended to non-fans, more the über variant. Contrast with Public Medium Ignorance, where you're supposed to dislike the work even if you didn't watch it.